I think Jimmy Dolittle said, “There is no good reason to be flying near thunderstorms in peacetime.” There could be an exception, fire fighting with a helicopter. As all of you have seen on CNN and the national news, for the past week Southern Oregon had several days of intense lightning activity. This my story of a lightning bust. Sure we had ample warning of impending thunderstorms and lightning. 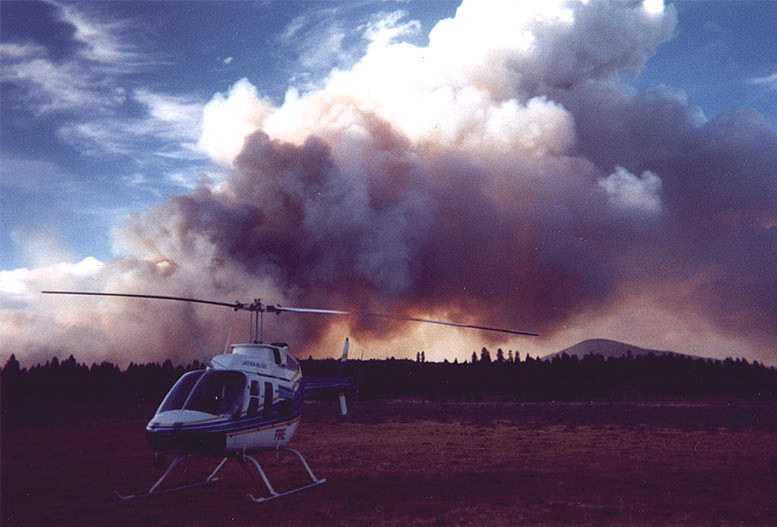 The question was, “Will there be rain with the thunderstorms?” The crews, both ground and air, had been on enough fires to be proficient at fighting wild land fires. We thought we were ready. Thunder clouds started building by 2PM, the wind was picking up and from the heliport in Lake View I could see down strikes to the west. I pulled on my nomex flight suit as the first calls of smoke reports started coming from the mountain top look outs. Our first dispatch was 23 miles due west. Looking at the wind sock at the heliport, the wind was coming out of the South at 15 MPH. Looking 200 yards to the East the at the FBO’s wind sock, the wind was 20 MPH out of the East. I took off into the wind to the South, just about through translational, the wind shifted to out of the North. Flying direct to the fire was out, as a large fully developed thunder cloud blocked our way. I had no intention of flying near the towering anvil shaped clouds. Flying around the storm I arrived at the small lightning caused fire. As I hovered down through the tall Pine trees I was anticipating the afternoons flying. Quickly the crew was dropped off, they hooked up the Bambie Bucket, and I flew toward the dip site. En route to the dip site I spotted four more small fires. I was in for some of the most challenging flying since Viet Nam. We had been briefed about the unusual fire behavior this year. So the crew was playing it safe and not taking on the head of the fire. They were working on the flanks, and waiting for a wind change, air tankers or reinforcements. I was trying to dip out off a small lake about three miles from the fire. I knew I was in trouble, when on approach the ducks dived under water to escape the helicopter, and could only get half of their bodies under the shallow water. As I dropped the bucket into the lake I could see hundreds of duck butts sticking up out of the water. Naturally, the bucket wouldn’t sink, so I took off leaving the ducks, tails still in the air, to find a deeper dip site. I found a stock pond about 4 miles away and started dipping and dropping. I dropped about 10 loads of water and then needed to refuel. Thunder clouds continued to build in all quadrants. It was getting harder to dodge around the clouds and rain was splattering my wind shield. The ride was getting bumpy and I was having to put in some big power changes to hold altitude. When I landed at the fuel truck, the wind was swirling around the helicopter, hitting me from every possible angle. Leaves were blowing in the cockpit, I had taken the front doors off to drop water, and I was worried. I remembered a dark night in Viet Nam, near the Seven Sisters Mountains, much like now. Ground troops were in contact and needed gun ships and the Bounty Hunters were tasked with the flight. I was scared then and I’m scared now. I take on 50 gallons of Jet A and transport another crew for initial attack on a new fire. Reinforcements are arriving now from all over Oregon and Northern California. Dispatch is spitting out a solid stream of orders on the hundreds of new fires started by the dry lightning. Flying near and around me are Bell 206III’s AKA “Short Rangers” or OH-58’s, Bell 212’s or twin Huey’s, civilian UH-1’s called Bell 205’s and honest to God UH-1 Charley and Hotel models. Fixed wings including Cessna 206’s, 210’s, 337 or O-1’s, Beech craft Barons, C-130’s, DC-7’s, P2V’s and P3’s. Of course we have the Polish Dromadeers single engine air tankers. I’ve got the helitack crew spread outon five different fires and if wasn’t for my Garman 195 Global Positioning System (GPS) with “track back” feature, I’m not sure I could have remembered were I dropped them off. Soon I had flown 5.5 hours and it was almost dark. I have to be on the ground at Lake View by 8:55 PM or suffer the wrath of the BLM safety Gods. No flying after 30 minutes past sunset is one of the rules we fly by. While refueling we are treated to a double rainbow and a 360 degree brilliant red sunset. Lightning is flashing all around us and you can smell the ozone in the air. If some artist were to paint our sunset with the rainbows and lightning, it would look to many like something from another world. As soon as I refuel and the fuel truck is out of the way I crank up 12M. As I lift off it’s getting dark, turning on the position lights and the instrument lights I pick up my GPS heading for Lake View. I have lightning on three sides as I fly up the one canyon just before the final ridge to Lake View. Halfway up the canyon I’m flying at about 7500 feet above sea level and 1000 above ground level, I’m at 75% torque at 90 knots. Right then, I have a thunderstorm experience that I’ve only read about up until now. It feels like the helicopter has hit a solid wall, a loud thump as I’m thrown forward in my shoulder straps, followed by rotor RPM decaying. I lower the collective thinking I’ve had an engine failure. A thousand things are running through my mind, emergency procedures, prior experiences, getting out a radio call, but 12MIKE is still flying and I’m still flying her. The rotor RPM comes right back and I add some collective, still everything seems to be working. I’ve just hit a micro burst or wind shear so hard it felt like a solid object. I know how lucky I am to be in one piece, as many a aircraft have come out the other side of a micro burst looking like confetti. On the ground at Lake View feels good, an extra detailed post flight reveals no damage to 12M. I can already hear dispatch lining up resources for tomorrows fight of the Big Fire.